An interactive sonic ecosystem based on bacterial communication. Bacterial organisms exhibit a trait that is unique within the living world. As well as inheriting genetic properties from parent to child, bacteria are able to exchange genetic information with their neighbours, via packets of DNA known as 'plasmids'. This enables bacteria to temporarily adopt characteristics which may give them a competitive advantage in a hostile environment. Plasmids can be seen as semi-beneficial parasites which hop from bacterial host to host, giving rise to complex evolutionary patterns. Horizontal Transmission (2011) simulates these dynamics in a 3D space, representing populations of cells both visually and sonically. When sound is detected from the gallery space by the attached microphone, it is transformed into a plasmid and deposited in the virtual space. This can then be assimilated by the bacterial population, who then mimic these sounds in their inter-cellular communications. 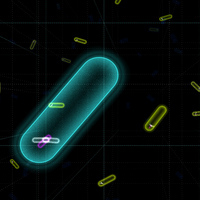 The bacterial world can be explored using a 3D control interface, with which an observer can navigate through the population, observing cellular dynamics and communication patterns. From a wider perspective, these genetic exchanges can be seen as a primitive form of information transmission, similar to the way in which ideas spread between higher organisms.